​TO BOOK YOUR SESSION CLICK ON THE "SCHEDULE NOW" POP-UP AND FOLLOW THE PROMPTS. Did you know that your best answers can be easily accessed through your heart....the seat of your intuition? JoAnn Bruhn's forte as a psychic is to help you access this information. Those in spirit want to share the happy news that there is no such thing as death and that the soul lives on as a higher vibration. JoAnn Bruhn's forte as a medium is to bring through their pertinent messages. "If you want to speak to the other side, call JoAnn. JoAnn has suffered many losses in her life including the death of her 10 year old son, Craig. JoAnn has honed her intuitive skills through classes with me as well as years of experience. 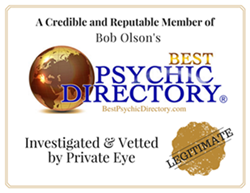 In addition to acting as a medium, JoAnn does psychic readings as well." ~Kathryn Harwig, internationally acclaimed intuitive, author, speaker, trainer and attorney. ​Founder of Sundance Project LLC, JoAnn’s mission is to share the beautiful gifts she has received as the result of her passionate embrace of life after the devastation of her young son Craig's death. In extending her services others, JoAnn continues to expand her abilities through dedicated practice and explorations within the intuitive arts. TO BOOK YOUR SESSION CLICK ON THE "SCHEDULE NOW" POP-UP AND FOLLOW THE PROMPTS.